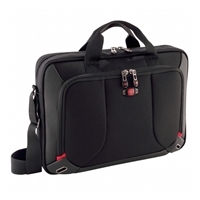 Carry all you gear in style with the Swiss Gear Platform laptop/notebook slim case. The Platform's padded laptop compartment provides protection for up to a 16" laptop, while additional compartments keep your electronic gear and essentials secure and organized. Transport is effortless thanks to the adjustable padded shoulder strap, dual grab handles and trolley strap. 16" x 11.5" x 2.75"